Impressive array of primary documents, photographs, commentary and miscellany relating to the novelist’s short life and controversial career. Mitchell, who works at the Thomas Wolfe Memorial in Asheville, N.C., is no disinterested bystander. He characterizes as “myth” the notion that the author of Look Homeward, Angel and You Can’t Go Home Again was an undisciplined genius whose literary sequoias were shaped into artful (though still sizeable) bonsai by Scribner’s editor Maxwell Perkins. 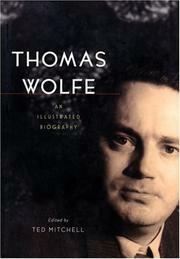 The biographer defends, too, the autobiographical character of Wolfe’s fiction, arguing that “the roots of all creation in writing are fastened in autobiography.” The text begins with the writer’s birth, in 1900, proceeds chronologically to his death, in 1938, then considers his uncertain reputation today. Mitchell laments Wolfe’s absence from the contemporary academic canon, speculating that his novels’ enormous length may be somewhat to blame. The wide array of illustrations includes photographs of the author at all stages of his life (an amusing one shows him at age eight with Byronic curls), as well as images of his family, friends, literary acquaintances. A sad one captures his brother beside the bed where Wolfe lay dying of tuberculosis. Photocopies abound of all sorts of documents: undergraduate transcript, Master of Arts diploma from Harvard, contracts with Scribner’s, a sweet telegram from F. Scott Fitzgerald congratulating Wolfe on Angel, death certificate. Also reproduced are newspaper and magazine articles and reviews of Wolfe’s work, including a generous selection of reactions from the newspapers in Asheville, his hometown. Mitchell reprints long, informative passages from Wolfe’s correspondence, notebooks, stories, novels and poems. His bitter exchanges with Perkins just before Wolfe left Scribner’s for Harper & Bros. make painful reading. A brief, brisk narrative stitches it all together. Lush and fascinating: an essential reference for Wolfe fans and scholars.